Last night I had my palm read by a beautiful mezzo soprano in a basement studio in Dalston. Not a typical mid-week encounter, I grant you, but one which will stay with me for the foreseeable future (even if that future apparently contains split love lines, an unstoppable tragedy, and a curious amount of frozen cauliflower). Yep, didn’t make sense to me either. Moving on swiftly. 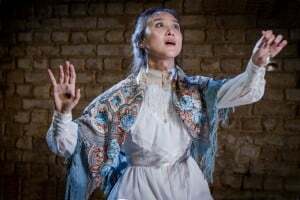 I am, of course, talking about the latest export of the Grimeborn Festival at The Arcola Theatre – a stunning double bill including the European premiere of The Medium by Peter Maxwell Davies and The Wanton Sublime by Tarik O’Regan. Maxwell Davies, known for his eclectic approach to composition, did not disappoint with his one-act opera for an acapella singer. The exquisitely excruciating story of a woman overcome by the man-made world around her, and her descent into madness, was not overplayed or detrimental to the integrity of the character at any point. Naturally I was a little disappointed that there were no bagpipes (Maxwell Davies has famously incorporated them into previous orchestral works) but the return to a simpler, almost plainchant acoustic was welcome. However, while adhering to the cadences of plainsong, the opera, expertly performed by Hai-Ting Chinn, was anything but peaceful. The mix of simple and off-beat discordant passages and swooping sequences conveyed both a materialistic terror and the sublime serenity of the protagonist. This, of course was the piece during which the mezzo moved panther-like through the audience to predict futures. It has to be said that the critically acclaimed Chinn maintained both a vocal and physical intensity beyond her years throughout the whole piece. Struggling to picture The Medium? In short – think Hildegard of Bignen/ The Woman in White on acid and you will be on the right track. The final piece, O’Regan’s electro-acoustic work for chamber ensemble and mezzo soprano saw a modern take on the Virgin Mary (I did keep a look out for Mel Gibson but annoyingly couldn’t spy him). 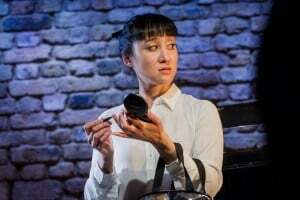 Chinn, impressively, took on the daunting mantle of ‘Mary’, and, with the help of New Yorker Anna Rabinowtiz’s daring libretto, explored both the modern Virgin’s desire for independence and human understanding. The staging proved more limited than The Medium. I practically had to sit in Joanna Lumley’s lap to see where Chinn was gesturing towards the finale (no complaints this end, Joanna – your hair was great by the way). Despite that, the Orpheus Sinfonia were a delight for the ears and eyes as they skipped effortlessly across the acrobatic score. No one ever said that opera was easy. The truth is I don’t know what the future holds for this new, pared down, musically challenging style of opera. What I can predict with some certainty is that while Grimeborn continues to do what it does well and composers, like O’Regan and Maxwell Davies, have the courage to realise their artistic vision the future is looking bolder and brighter. And not a cauliflower in sight! Dates running until Sunday 29 August 2015, 8pm. Tickets available from www.arcolatheatre.com and on 020 7503 1646 priced £15 (£12). Watch this space for news of the 2016 Grimeborn season.